If you love sharing the delicious desserts you bake, the HelloCupcake Portable Cake & Cupcake Carrier / Storage Container is just for you!This caddy / storage container transports all of your tastiest homemade creations wherever you need to be - party, picnic, wedding, or after school event. Prepare your desserts in advance, store them securely, and carry them in this sturdy yet stylish container; don't worry about additional prep when you arrive, or damaging the sweets in transit.A great gift for your favorite sweet who likes to bake!Key features include:- Versatile design that can carry and store any number of baked goodies - Large capacity (nearly 10.5 inches in diameter and 4 inches high) that can fit large cakes, frosting topped cupcakes, or piles of cookies - Snap-locking handles to keep desserts fresh and secure inside, and an adjustable handle on top for easy transport - An expansive clear plastic dome that allows for easy inspection from the outside, and plenty of room to ensure frosting is undisturbed in transit - BPA free plastic that keeps your food fresh and healthy- Available in five fun colors: blue, purple, green, orange, and fuchsiaDue to its size, we recommend washing this caddy by hand with warm soapy water, and drying it with a clean cloth or by air drying. VERSATILE DESIGN KEEPS BAKED GOODS FRESH - The HelloCupcake cake and cupcake caddy is great for carrying or storing cakes, cupcakes, cookies, pies, muffins, breads - anything you like to bake. Our clear, rounded dome keeps delicate frosting intact during transport. 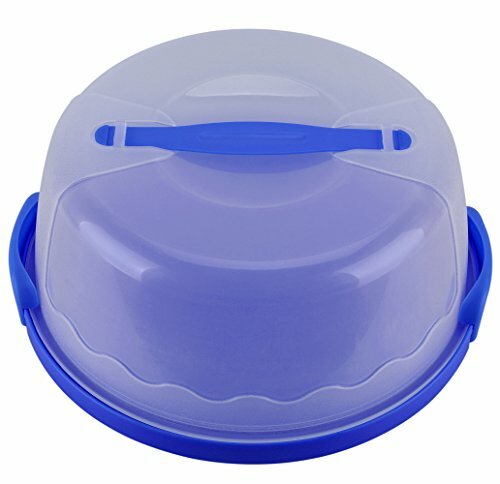 DURABLE CONSTRUCTION - Two strong locking clips secure the dome to the tray and help maintain freshness during storage. The sturdy, sliding handle on top of the dome is easy to grasp and convenient for carrying. The cake carrier's stable base and strong locks make it ideal for car travel, outdoor picnics, or simply secure storage in a busy kitchen! SEE-THROUGH COVER - The clear plastic dome helps to showcase your deliciously decorated creations. The dome's generous high sides keep cake icing and delicate decorations safe and secure. FOOD SAFE & ECO-FRIENDLY - BPA-free plastic will keep your food healthy, fresh, and tasty! The carrier is microwave-friendly. If you have any questions about this product by HelloCupcake, contact us by completing and submitting the form below. If you are looking for a specif part number, please include it with your message. 1 Dozen Mini Cupcake Container (12 cavities), 25 ct.